Cataract and Intraocular Lens Implant, Presbyopic Correcting Lenses Implants, Glaucoma Lasers, MIGS (minimally invasive Glaucoma Surgery) and Consultation. Fellowship trained glaucoma and cataract specialist focusing on the diagnosis and treatment of glaucoma and cataracts. Voted “Best Doctors” from 1991-2014 by Best Doctors, Inc. Articles & Publications by Stuart Ball, M.D. Stuart F. Ball, M.D. grew up in Charleston, South Carolina, went to college at the University of Virginia, and then returned to Charleston for medical school. He completed his ophthalmology residency at LSU in New Orleans (where he met his future wife Mary Anne Coley of Mobile). He then embarked with Project Orbis, an international project to teach eye surgery around the world, followed by a glaucoma fellowship at New York Eye and Ear, a year of practice in Juneau, Alaska and a fellowship in glaucoma at Ochsner Clinic. 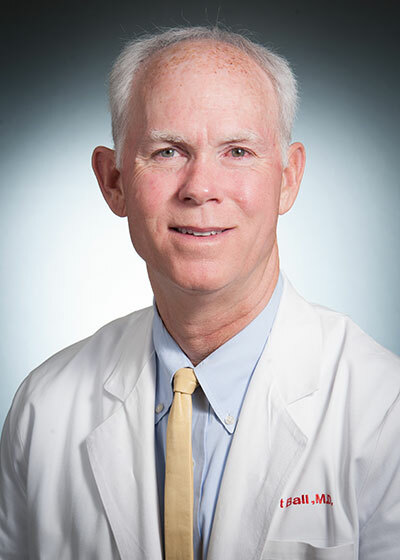 In 1985 Dr. Ball joined the faculty at LSU in New Orleans, where he rose to associate professor and residency director, teaching and conducting research in the medical, laser and surgical treatment of glaucoma and cataracts. He continued his Project Orbis involvement, eventually teaching surgery in over 20 countries. In 1992, with now three children, Dr. Ball moved his growing family to Mobile to join Premier Medical and shortly after, welcomed his fourth child. Dr. Ball enjoys the challenge and excitement that comes from trying to preserve and improve the vision of his patients. He has been the first doctor in Alabama to employ many innovative surgical interventions. His clinical skills and sustained investigatory work has garnered “Best Doctors in America” recognition of the past 20 years.